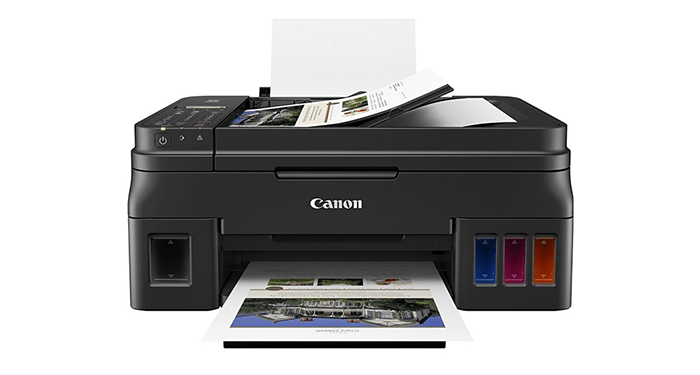 When introduced in 2015, supertank printers like the Canon Pixma G4210 aimed to remedy the high cost of printer ink refills. Instead of pricey cartridges, the first supertank printers relied on reservoirs that you could replenish individually with a $12 bottle of cyan, magenta, or yellow ink. Enough to last you two years. But the early models couldn’t match the inkjets in terms of text and graphics quality. Things have changed in the past few years. With the price of $300, the Canon might be a big red flag, even though it’s one of the least expensive tank models. It would require just $20 more over the course of four years—for a grand total of $320. The G4210 comes with many useful features, including WiFi connectivity, fax capability, and OCR (optical character recognition) software, which allows the text in a scanned document to be edited in a word processor program. The printer cannot auto-duplex (print on both sides of a sheet of paper), and its LCD is black-and-white. That may disappoint those who enjoy previewing photos in color before printing them. While the Pixma G4210 won’t satisfy everyone, it hits all the major notes people care about. And if you can commit the $300, there’s no reason to hesitate if you want to save money on ink. This entry was posted on Tuesday, June 12th, 2018 at 11:30 pm	and is filed under Canon, inkjet, printer. "New Xerox Global Print Driver for Better Experience"